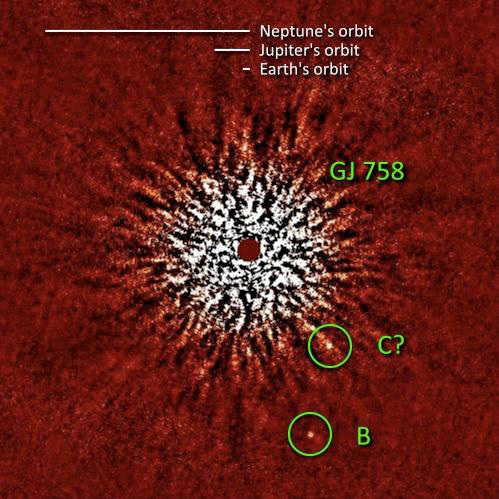 We don’t exactly know what to call GJ 758 B, which may be a brown dwarf or simply a large planet of between ten and forty Jupiter masses. But the detection is being hailed as the first direct observation of a ‘planet-like object’ orbiting a star similar to our own Sun. We have the new High Contrast Coronagraphic Imager with Adaptive Optics (HiCIAO), recently attached to the Subaru Telescope and working in the near infrared, to thank for the detection. Image: The August 2009 discovery image of GJ758 B and C, taken with Subaru HiCIAO in the near infrared wavelength. Without angular differential imaging, the star’s speckle halo (burst-like feature in the center) would overwhelm the signals from the planet candidates. Credit: Subaru Telescope/NAOJ. GJ 758 is a G9-class star of about 0.97 solar masses some fifty light years from the Sun. As to the newly discovered companion, it’s currently about 29 AU out, about the orbital distance of Neptune, but we do not yet have further information on the size and shape of its orbit. At 315 degrees Celsius, the object is the coldest companion yet imaged around a G-class star. A second companion of similar mass is suspected at about 19 AU, roughly the orbital distance of Uranus from the Sun. The presence of massive planets at this distance from their primary challenges our current thinking on planetary formation and may help theorists to refine their models. 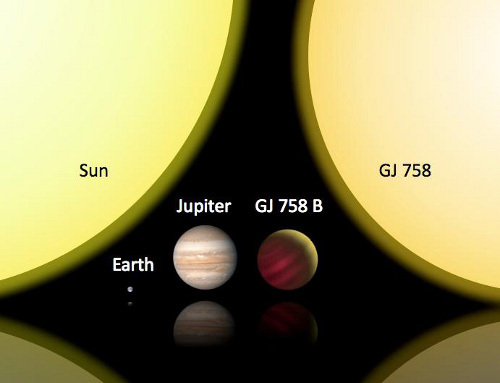 Image: Size comparison between representatives of our Solar System (Sun, Jupiter, and Earth) and the GJ 758 system. GJ 758 B’s temperature of about 315 C makes it glow cherry-red. The paper is Thalmann, “Discovery of the Coldest Imaged Companion of a Sun-Like Star,” Astrophysical Journal Letters, published online 18 November 2009 (abstract). More in this Princeton University news release. Nice find! It never fails to amaze me that science and technology, products of human intelligence, have evolved to the point where images can be made. I seriously doubt this object formed via core accretion even around a high metallicity star (Btw, what is this stars metallicity relative to the Sun?). Simulations of core accretion planet formation predict that gas giants even smaller than this object are highly unlikely to form at distances of 20 A.U. or greater from their parent stars; so, perhaps it formed via gravitational instability. Also, it should be interesting to see how many more of these types of systems show up as direct imaging improves as a technique for exoplanet detection. GJ 758 B’s temperature of about 315 C makes it glow cherry-red. Would a 315°C brown dwarf really give off much of a visible glow at all? The temperature is below the Draper point, but that isn’t a hard cutoff. Fascinating images, but anything that is 315 C at the same distance from a sun-like star as Uranus and Neptune sounds more like a brown dwarf than a planet. I’m looking forward to similar images produced by Cash Webster star shade, hopefully in the near future and hopefully of inner terrestrial planets. Its worth noting that while this may be the coolest object imaged around a Solar-type star, there are at least four other objects with similar mass and temperatures that do not orbit another body.